Focusing on a few products is characteristic for successful companies. This doesn’t necessarily mean that other companies following a different strategy are unsuccessful. But focusing on a few products, trying to bring features and services together in a unique environment, and developing new products which seamlessly fit into this environment is the strategy of the most valuable and innovative company in the world, it’s Apple. The actual offer of the company still follows this principle. The brands focus is on providing a superior customer experience by offering solutions from a single source. It’s the job of leaders to be clear about the company’s nonnegotiable core values. They are the riverbanks that help guide all employees as they refine and improve on performance and excellence. Collecting data is more common than ever, particularly with the advent of Web analytics. The metrics to be tracked go above and beyond either web or financial information as well as direct contact to customers. A company stretched thin on resources will never be able to overdeliver, and quality depends somewhat on the ability to exceed expectations. An infrastructure has to be created that anticipates revenue. When a company surveys customers on the quality of service, make sure that everyone, from the top down, knows of the results and receives recognition for the things that are going well. This all builds the DNA of a successful company. CEOs and all employees in the headquarter as well as in stores must be integrated in the process of engagement. A product line up has to reflect the companies care values and the clearly defined targets. This is why Apple’s product line up is restricted to a handful number of hard- and software products targeted at a perfect user experience. If you look at the Apple Store there are many other products of sought out vendors available to give other companies the chance to participate in the companies success. That attracts others to at least boost the business. An outstanding example is the App Store with more than 1m apps (as of Jan 2014) and more than 200k registered app developers. They all breath life into Apple’s hardware offer. As you can see even Apple’s software offer is restricted to a handful products which just top the user experience off. 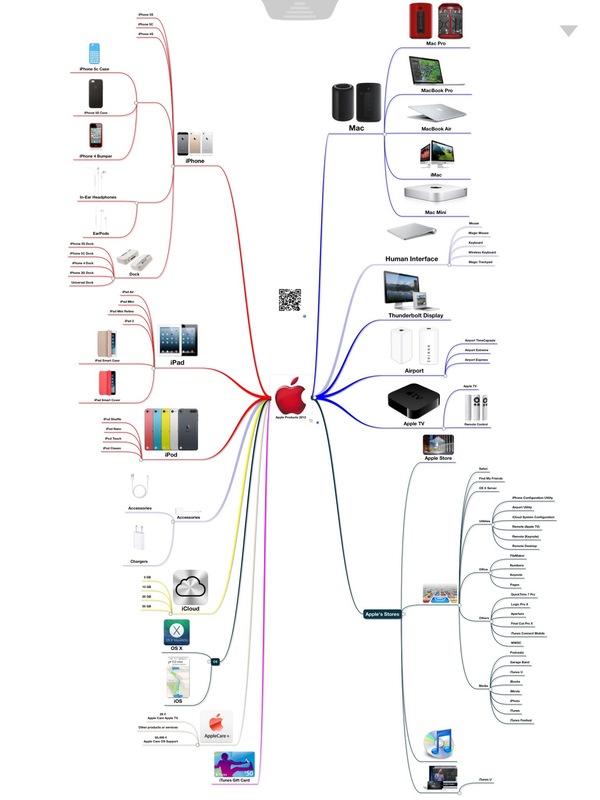 Here is a mind map showing the complete product line up of Apple. Please tap on these single images to see parts of the map. Analyzing all main products, extracting them, and re-organizing them we get the components of Apple’s ecosystem. Focusing on essential features and seamless usage as the main target of the design philosophy. There are two operating systems and specs of all hardware components are an integrated part of the development. Keeping hardware and software development together results in the highest possible performance and user experience. Success then is forced by an outstanding design. It’s not the junk market Apple is interested in. Steve Jobs, returning to Apple in 1996, defined the direction with a focus on an entire user experience. Tim Cook is following this strategy and there is no need to move into diversity because this business concept works perfect and competitors are on the way to copy this strategy. There is Samsung working on an own operating system, Microsoft with the XBox and it’s Surface computer, and Google with it’s mobile device Nexus. It’s the only way to stop fragmentation and increase the user experience.